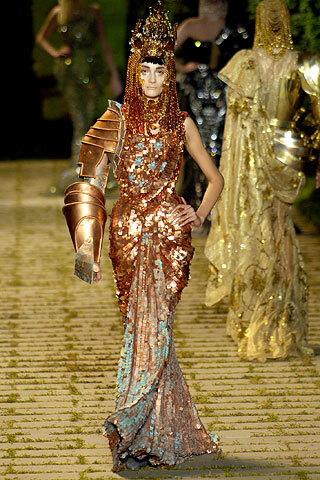 The Alexander McQueen Autumn/Winter 2008-2009 Show was partly inspired by Queen Victoria. Other Queen Victoria-influenced collections : Jean-Charles de Castelbajac Autumn/Winter 2006-2007 (this show, which paid homage to British icons, featured a dress, decorated with a black-and-white portrait of Queen Victoria and yellow Smileys), Libertine Spring/Summer 2006 (this show highlighted several « Queen Victoria » patterns). 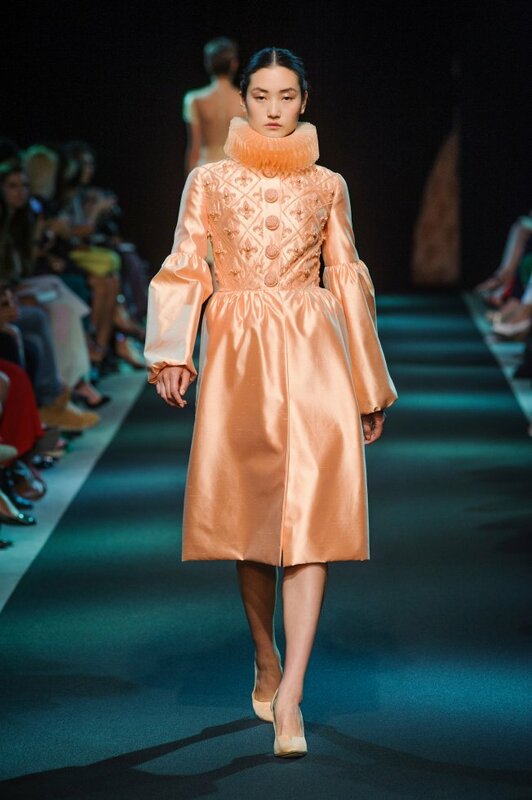 France’s splendor of royalty influenced the Georges Hobeika Couture Autumn/Winter 2013-2014 Show. Other France-inspired collections : Anna Sui Spring/Summer 2013 (this show was based on the style of the Second Empire in France, mixed with punk), Chanel by Karl Lagerfeld Resort 2013 (Karl Lagerfeld said that the theme of this collection was « Versailles in a Socialist France »), Jacquemus Autumn/Winter 2013-2014 (this show was an homage to France). 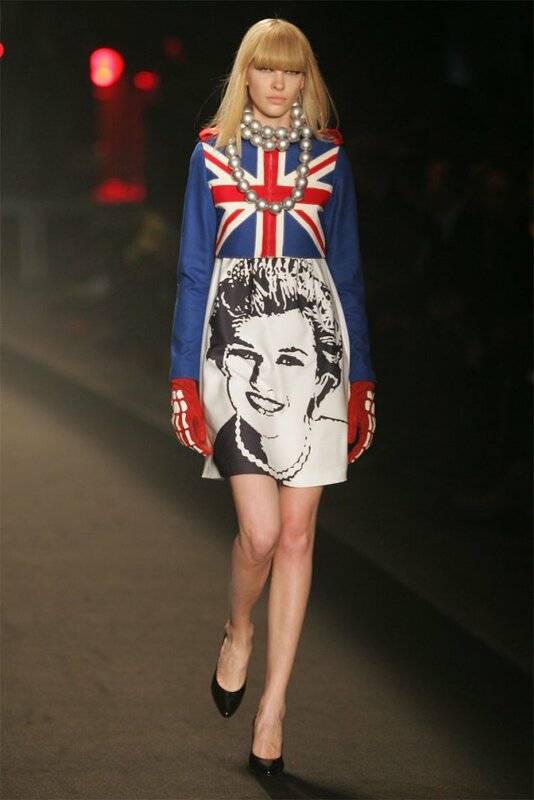 Diana, Princess of Wales was one of the British icons who were celebrated in the Jean-Charles de Castelbajac Autumn/Winter 2006-2007 Show. Other Diana, Princess of Wales-inspired items : Dior (in 1995, Lady Diana fell in love with a bag that Gianfranco Ferré had designed for Dior, which was later renamed « Lady Dior », in her honor), Tod’s (in March 2013, Tod’s released the « Timeless Icon » book, to pay homage to Diana, Princess of Wales, which highlighted pictures of Diana with her beloved Tod’s tote). 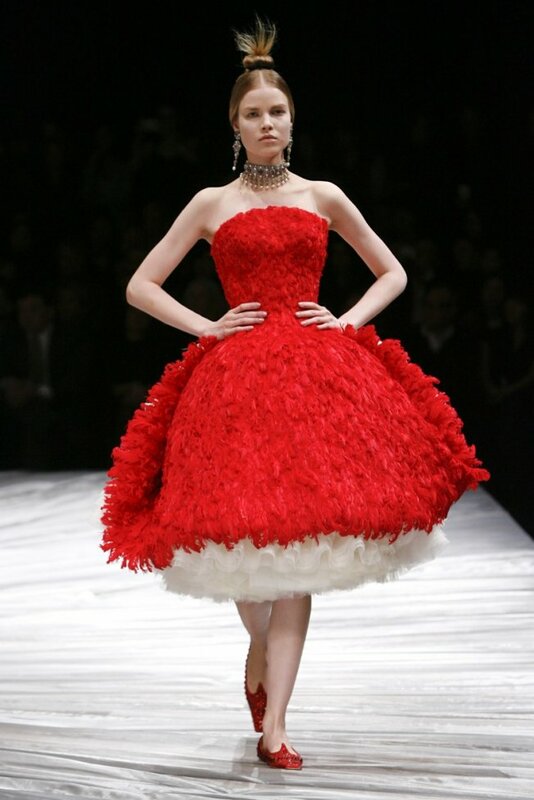 To read about Union Jack-inspired collections, search for the « Union Jack » post that I published on March 18, 2013.